First and foremost, happy Go Skateboarding Day, everyone! While most skateboarders treat every day like Go Skateboarding Day, we can all tip our hats to Don Brown for giving us permission to collectively take to the streets every summer solstice. In the same vein as the act of dissecting titles, dogmas, and skateboarding’s social norms, let’s examine the art of pushing. As much as skateboarding focuses on freedom of expression and rebuking society’s arbitrary strictures (who doesn’t love the irony of Pretty Sweet’s “Dudes in Suits” chapter? ), there are a few rules in skateboarding that stick out like proverbial thorns in a rosebush. Perhaps the second-most dreaded pariah (“mall grabbing" will always be number one), pushing mongo is a no-no we’re taught to avoid pretty early on in our careers. The gravity of this offense may not have materialized entirely out of the ether, as pushing mongo does make it more difficult to get a healthy amount of speed and erodes much of the sense of control and direction one gets from pushing correctly. All that said, let’s be honest: unless you’re charging like Busenitz, is a mongo push really going to stop you from ripping? I won’t jump to conclusions, but there’s a palpable form over function argument to be had here. Of course, as with any code of conduct, there are always exceptions, and it is here that I, among others, advocate the switch mongo push. If you can push switch and make it look as flawless as Ricky Oyola, then more power to you, but it wasn’t that long ago that the switch mongo push was fully accepted. Not only was it accepted, it had utilitarian value for young bucks trying to figure out somebody’s stance. A young skater unable to tell whether a line was switch or regs only had to look at the push to piece it together (in all seriousness, the switch mongo push at 2:59 was literally the only way back in the day that I could tell Ryan Denman was regular footed; his ambidexterity was unbelievable). To further my case for the switch mongo push, some people are still masterfully rocking it. Josh Kalis, Tiago Lemos, Gino Iannucci—all of them have made the switch mongo push look downright enviable. The switch mongo push may never regain the prevalence of yesteryear, but on this day of ceremony, let us celebrate this part of our past and present. Either way, let’s hope the stigma behind it fades in time as skateboarding inevitably finds its way back to its roots. Just like I enjoy a full-throttled switch mongo push (preferably in baggy pants, or, even better, track pants), I enjoy a no-nonsense mango. On unbearably hot summer days, I come home from skating drenched in sweat, rummaging through the kitchen for anything that will (a) hydrate me, (b) fill me with some quick carbs and (c) taste delicious. Thankfully, a ripe mango will suffice for all three. When bought whole (in season), mangos are surprisingly cheap and they provide a host of benefits including bountiful antioxidant compounds, high fiber, and vitamin C (both of which help lower cholesterol), vitamin A (improves eye health), and tartaric, malic, and citric acids (help to alkalize the body—i.e., good for your joints). Additionally, studies have suggested that the juices in mangos may be key in preventing heat stroke. 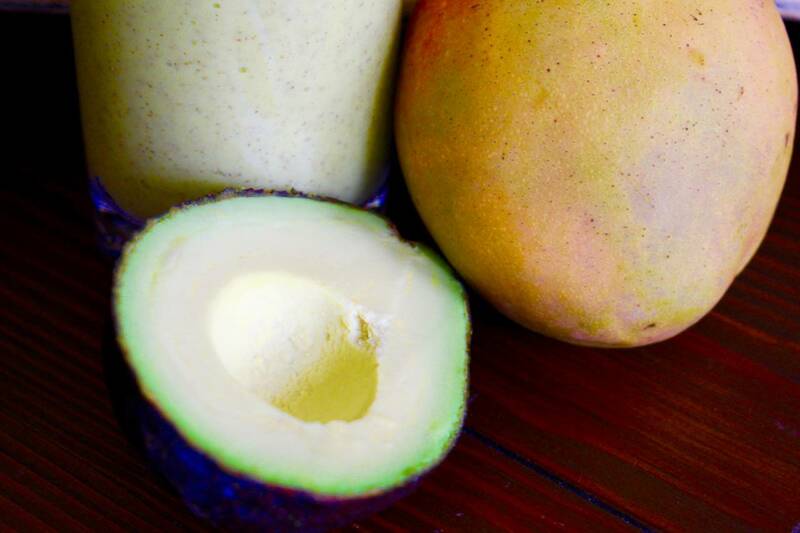 That alone should be argument enough to indulge in a juicy mango after your session, but in the interest of creating the total package, I wanted to throw in a few more things to make this smoothie the ultimate post-session smoothie. In addition to plenty of quick carbs, your body needs healthy fats and protein for a full recovery after a long summer session. 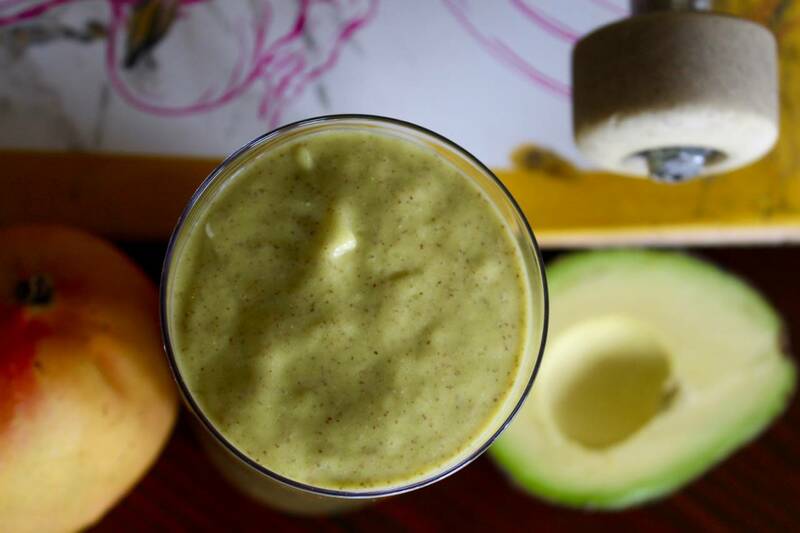 For that reason, this mango smoothie also has some avocado, hemp protein, and chia seeds. Not enough? I also throw in some coconut water to help replenish your body’s electrolytes. The result is a tangy—yet creamy—mango smoothie that will help you keep pushing with the same ferocity with which Tiago (switch mongo) pushes in De la Calle/Da Rua. 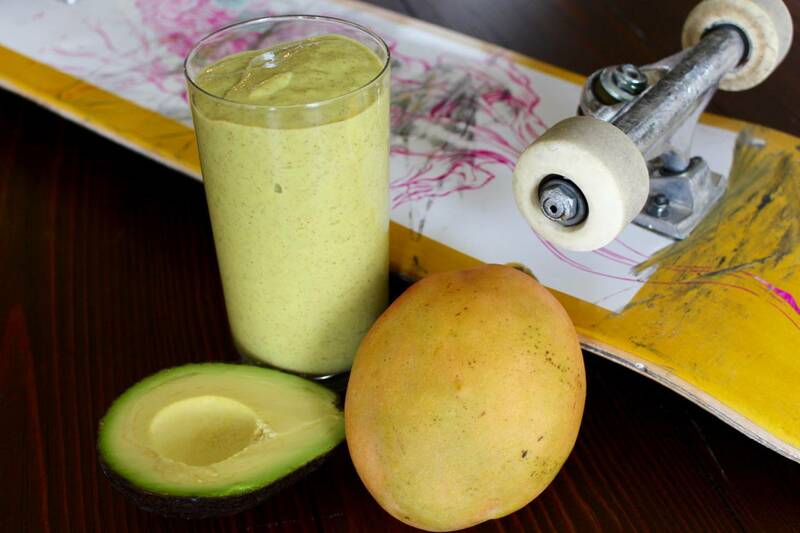 Ready to push switch mongo with a switch mango smoothie? Let’s do it. Throw the mango, avocado, pineapple, coconut water, chia seeds and hemp powder in a blender and blend it all up until it’s a tropical green mush (perhaps slightly darker depending on the pigmentation of the protein powder). Add more coconut water if you want it to be thinner. Guzzle it down, cool off, then go watch some late ’90s/early ’00s skate videos and marvel at the prevalence of the switch mongo push. Scientists use the Kelvin scale to measure temperature, but this Kelvin’s heat is off the charts. Ya boi is on fire!